Condition is Used. Dora # 058. Pierce # 055. BONUS fidget spinner PLUS Series 2 ereader card of your choice. Pick TWO cards from the list below 053 Admiral. 048 Nibbles. 040 Apollo. 033 Chevre. 030 Plucky. 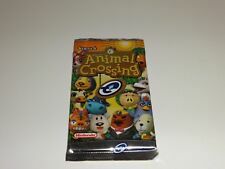 Animal Crossing E Reader Promotional Card - NES Link Design - Nintendo Power! It's a design card that generates NES Link holding the Triforce for your shirt, hat or umbrella! Animal Crossing E-Reader card set of two. - D01 Shine Sprite - D02 Jumpman Mario Mint condition in sleeves. Character: Spike. Condition: Crisp clean condition. Never used or scanned. Adult owned & kept. Out Of Print. Note: Card pictured is actual card you will be receiving. Character: Kapp'n. Type: Single Collectible Trade Card. This is for a classic Series 2 Nintendo e-reader Character card, 076 Grizzly. Card is in fine condition. Animal Crossing Card. Condition: Crisp clean condition. Never used or scanned. Adult owned & kept. Out Of Print. Note: Card pictured is the actual card you will be receiving. Design: Shine Sprite. Condition: Crisp clean condition. Never used or scanned. Adult owned & kept. Out Of Print. Feature: Design Card. Character: Jay. Condition: Crisp clean condition. Never used or scanned. Adult owned & kept. Out Of Print. Note: Card pictured is actual card you will be receiving. Animal Crossing E-Reader Town Tune Card M14 Comrade K.K. 027 Rasher. 006 Mr. Resetti. Hello and thank you for visiting my listing. 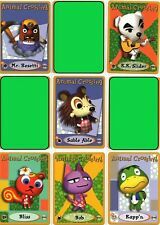 For sale today is a lot of 12 animal crossing e reader cards. Everything in the photos is included in this sale. Condition: Cards are Near Mint - Light Play. Overall excellent. If you have any questions, please contact me prior to purchasing. US SHIPPING ONLY THANKS! Character: Kody. Condition: Crisp clean condition. Never used or scanned. Adult owned & kept. Out Of Print. Note: Card pictured is actual card you will be receiving.